Only one week to go! 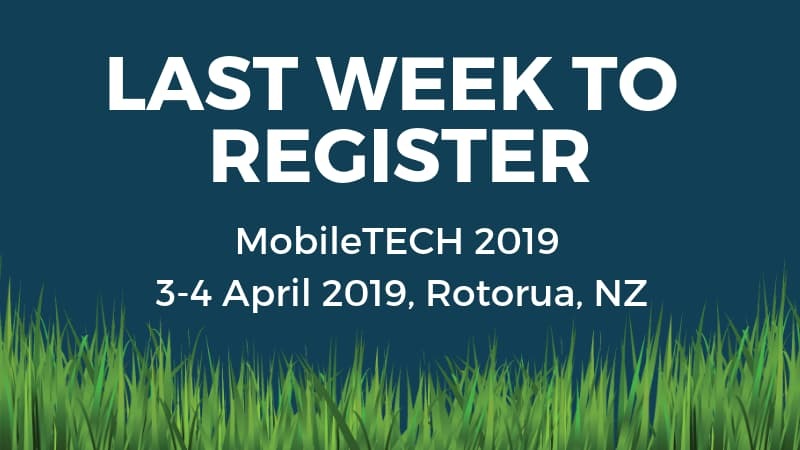 Well over 250 technology leaders, developers and early adopters are already registered to attend MobileTECH 2019. This event is running in Rotorua, New Zealand, on the 3-4 April 2019. MobileTECH is an annual event showcasing the digital technologies transforming the agricultural, horticultural and forestry sectors. This two-day programme features 30 industry experts from around the world. MobileTECH will cover how new technologies, like machine learning, the Internet of Things, and automation are being integrated into businesses throughout the sector. Click here to view the full programme. Please note that PAANZ are also hosting a pre-conference half-day workshop at the venue. This free workshop will cover AgGateway and how this global initiative on data standards can help New Zealand. Click here for full details on the workshop, including how you can to register. MobileTECH 2019 is a not to be miss event. There are still discounts available for group bookings and supporting industry association members. Register now to avoid missing out.